Our 4x4 tours cross the stunning Sardinian territory and are designed to meet the needs of everyone. Selected paths of different technical levels suit the skills of every driver. 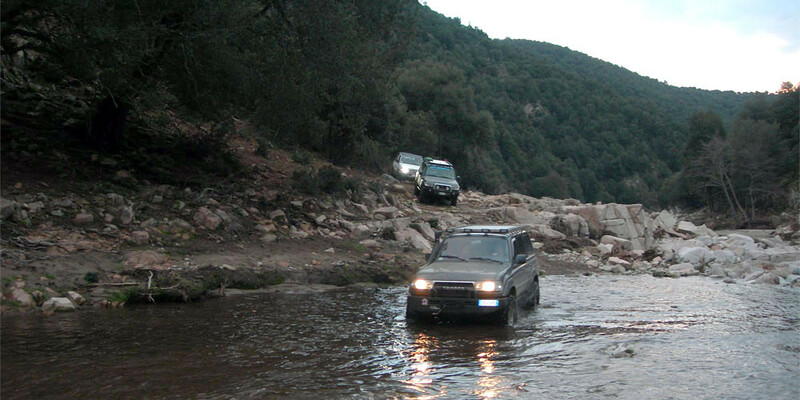 4x4 Tours cover various areas of the island (Barbagia, Ogliastra, Gallura, Sulcis etc.) and may have different characteristics. It is possible to live a different experience on each tour, exploring new routes and landscapes and discovering many aspects of the traditional cuisine and Sardinian folklore. 4x4 tours cover routes that are mainly off-road, all the off-road cars have the gearbox (no SUVs), some of the stages comprehend the use of the road book. Groups can customize their tour by choosing the dates, areas, degree of difficulty and all the other details . Drivers which are not part of a group can choose the tour that most suits their preferences between our Organized Tours. 5th stage: Jerzu - Orgosolo, 30 Km with road-book - 100 Km in convoy, all dirt. The path is suitable for everyone but provides (optional) technical variants for the more experienced drivers. - Enduro or Motorally special test. - Cross Test and Enduro Extreme test. - Personalized meals and tailored diet for athletes.